What does it take to free a thief? Thief of Corinth is a wonderfully engaging and swift-paced Christian historical fiction that drops you into its reality where you follow the scent of cloves, pine, sandlewood, and rosemary, feel the heat of summer baking the city, and follow the exploits of a young woman, Ariadne, as she finds truth and love amidst the backdrop of family and friendships, athletic competitions, and the visit of an apostle. Tessa Afshar’s novel opens with Ariadne accidentally sighting her father as he sneaks off during the night. Following him, she witnesses him breaking into a villa, then fleeing, chased by the owner’s guards. Even as Ariadne aids her father in a daring escape, she is drawn into his deception and finds she has a talent for theft and a desire for the feeling of control and freedom that it brings. For Ariadne greatly desires the freedom her father offers. Her grandfather is forcing her into marriage with a brute, and her mother is cold, distant, and critical. Thief of Corinth is a map of one woman’s journey to ultimate freedom. When Ariadne escapes to her father’s home, letting someone else pay the price for her freedom, she finds herself shunned and belittled by the young women of her father’s social circle. But Ariadne doesn’t mope and whine about her fate, she embraces her life as a thief, making choices that could cost her and her father their freedom and their lives. And it may cost the love of a man she’s come to admire. Thieving is the life she has chosen, but it might not be a choice she can live with. It will take time and the help of friends, family, and those she thought were enemies, but Ariadne is going to discover what it takes to free a thief. Ariadne’s gymnastic skills and fleetness of foot are just a few of the skills needed to inveigle her way into the homes of the high and rich members of society, seeking where their wealth is hidden so that she and her father can return in the cover of night to steal it away. But someone knows that her father is the Honorable Thief and blackmails them. How deep does the corruption go? Can she and her father escape the net of the blackmailer? Are friends closer than she thinks? Can she ever be truly free again? Through it all, we know that Ariadne takes responsibility for what she’s done and the consequences, and I absolutely love that accountability. As Ariadne says, “Yet the final blame, as you and I know, dear Paul, rests with me. It was I who chose as I did. I could have taken the wounds of my early life and turned them to healing. Instead, they became my excuse to do as I wished.” And admitting responsibility is the start of an incredible journey. I loved this book so much! 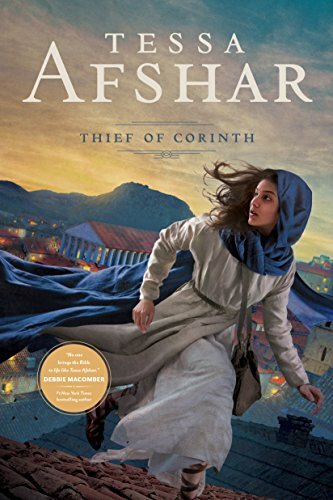 Thief of Corinth is an indelibly rich and fulfilling story, the world-building is incredible, and I finished it just wanting to dive into the next book. This is the first book I’ve read by Tessa Afshar, but she’s now on my favorite authors list, and I’ll be reading more. Highly recommended for anyone who loves historical fiction, stories of redemption, Biblical stories, or tales of strong women coming into their own. Trigger warning: There is a scene of the aftermath of violence against a woman and brief discussion of another instance. Both are brief, not overly graphic, and easily skimmed past; just putting that out there as a heads-up.